Stitch up this quick and easy crochet shawl pattern that showcases a delicate design for yourself or as a thoughtful gift. The repetitive net stitch design of this pattern is suitable for crocheters with minimal experience. 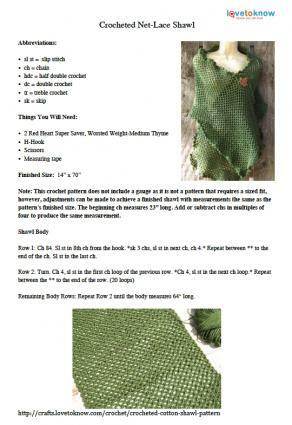 Click on the PDF image to download the pattern for printing. Try these helpful tips if you have trouble downloading the pattern to your computer. There are so many wonderful yarns available that quite often a crocheter may want to use a different yarn than what a pattern calls for. While most labels have a weight and gauge listed on the label, they can be confusing to read and understand. A quick WPI test can give you immediate results on size comparisons. WPI means "wraps per inch." For a project that requires an exact fit, such as a garment, you will want your WPI to be the same as the yarn brand or weight in the pattern. WPI is, after all, measuring the thickness of the yarn strand. Blankets, scarves and shawls are examples of projects that do not require an exact fit, thus allowing for a bit more leeway in choosing a yarn with more or fewer WPI than the pattern. In addition, if you are still trying for a close match in yarn size but can't find a suitable WPI substitute, you can experiment with changing the hook size to make up for a thicker or thinner strand. Carry a small ruler in your purse or a pencil with one inch marked off on the side of a pencil. Pull a small amount of one end of the yarn out of the skein in the store. Wrap the yarn around the ruler or pencil until the strands fill a one inch space. Do not stretch the yarn while wrapping. Count the number of wraps to determine the WPI of the yarn. To keep the store staff happy, unwrap the yarn end and tuck it back in the skein. While this shawl pattern can be crocheted using yarns of any fiber, if you desire a shawl for warmer weather you will want to use a cotton yarn. This is completely doable. The following are a few tips you may find helpful in making your cotton yarn substitution. Check the WPI of cotton yarn possibilities against the 8 WPI of Red Heart Super Saver. Cotton yarn is heavier than a same-size acrylic yarn. Cotton yarn does not stretch unless it is wet. Stretch is important with most garments, but a shawl doesn't need the same degree of flex. The net stitch in the body of the yarn will create the stretch needed for comfort. A cotton blend yarn will have more give and drape. Handwash your cotton crocheted shawl and lay it flat to dry. Hanging to dry will stretch the shawl and the stretched fibers will not bounce back when dry. Mercerized cotton does not tend to shrink. The Goddess Shawl at All Free Crochet will have you feeling like the name implies. This gorgeous shawl looks similar to a vintage bed jacket and would be a beautiful addition to a wardrobe in any season. The pattern is categorized as easy, but some experience will be needed. Elk Studio has a beautiful Dixie Charm shawl pattern. This is a shawl with a basic triangle shape and simple stitches that create a lovely feminine pattern. A beginning crocheter with some experience will be able to achieve great success with this one. Prayer shawls are very popular. Try your hand at the healing/prayer shawl on Keep Calm and Crochet On UK. The thick yarn and the large hook work this shawl up very quickly. This is an easy pattern suitable for a beginner. A one-pound skein of yarn creates the cozy wrap found on Fave Crafts. Wear it out on the town or on a walk in the fall to watch the leaves turn. This is an easy pattern. Crocheting a shawl is a great way for a beginner to practice new crochet stitches. Simply make a chain the desired length or width for a shawl, then choose a different stitch to concentrate on for each row.